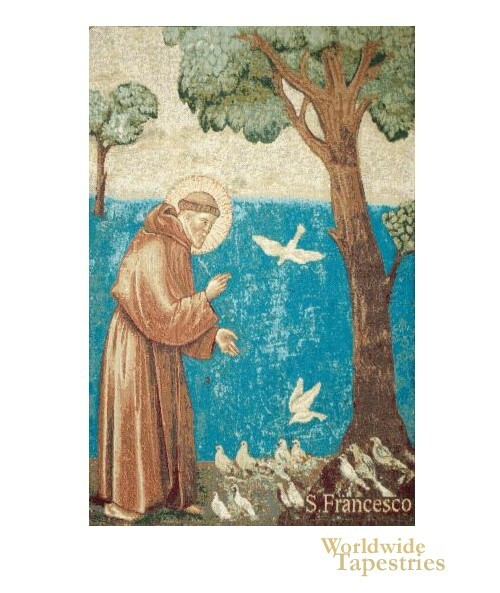 This religious art tapestry "St Francis Preaching to the Birds" shows St Francis with his love of animals. St Francis of Assisi was a devout person form a young age, and is known for his love of animals and the environment. Here he is seen with a gathering of birds coming to be with his presence. He is seen with a golden halo to symbolise that he is a saint with holy aura. This religious tapestry "St Francis Preaching to the Birds" is lined and has a tunnel for easy hanging. Dimensions: W 13" x H 18"
Dimensions: W 20" x H 27"